BACKGROUND: Thymic epithelial tumors (TET) are the most common tumors of the anterior mediastinum. Patients with advanced/metastatic disease are usually treated with palliative chemotherapy (CT). Unfortunately, even though various palliative CT regimens have been used for long time, there is a real scarcity of published Indian data regarding the experience of palliative CT in metastatic TET (mTET). MATERIALS AND METHODS: This is a retrospective analysis of mTET patients treated between January 2010 and September 2017. Patients who received at least three cycles of first-line palliative CT were included for analysis of response rates, toxicity, and survival and prognostic factors. RESULTS: Of the 49 mTET patients, 27 (55.1%) were males. The median age at diagnosis was 52 years (range: 25–65). Eighteen patients (36.7%) had Masaoka Stage IVa disease, and the rest of the patients had IVb disease. The most common site of metastasis was pleuropericardium (n = 18), followed by lungs (n = 16) and lymph nodes (n = 9). The median progression-free survival and overall survival (OS) were 11.2 months (95% confidence interval [CI], 8.7–13.6) and 20.2 months (95% CI, 17.1–22.8), respectively, for the whole cohort (n = 49). The median OS of patients with Stage IVa disease was significantly better than that of the patients with Stage IVb disease (log-rank P = 0.000). Moreover, the “responders” to first-line CT had a significantly better median OS than the “nonresponders” (log-rank P = 0.000). Various first-line palliative CT regimens were well tolerated in our patients. CONCLUSION: Adriamycin Cisplatin Vincristine Cyclophosphamide (ADOC), Cyclophosphamide Adriamycin Cisplatin, and paclitaxel + carboplatin all are viable first-line palliative CT options for mTET and showed a comparable survival in Indian patients. The present study suggested that “responders” to first-line CT and those with Stage IVa disease might have a better survival than “nonresponders” and those with Stage IVb disease, respectively. Thymic epithelial tumors (TET), including both thymomas and thymic carcinomas, are the most common tumors of the anterior mediastinum, although they are relatively uncommon. They typically occur in adults of 40–70 years age group and have an unknown etiology. Thymomas are locally invasive and commonly associated with paraneoplastic syndromes. On the contrary, thymic carcinomas are exceptionally rare malignancies with a reported incidence rate of 0.15 per 100,000 person-years and rarely associated with paraneoplastic syndromes. They have a propensity for local invasion and distant metastases and have a dismal prognosis in comparison to thymomas. Complete surgical resection is the preferred therapeutic modality in patients with early-stage TETs. Patients with advanced/metastatic disease are usually treated with palliative chemotherapy (CT) or best supportive care. In spite of high rate of disease control with first-line palliative CT in patients with advanced/metastatic disease, unfortunately, most of these patients relapse within 1 year of therapy and majority among them succumb to disease progression. Clearly, the optimal chemotherapeutic strategy for patients with advanced TET is still controversial. Because of its rarity, the clinical characteristics and potential prognostic factors of malignant thymomas have not been investigated in detail. Unfortunately, even though various palliative CT regimens have been used for a long time, there are very few published data of the experience of palliative CT in metastatic TET (mTET) from India. In the present retrospective study, we aimed to investigate the clinicopathological characteristics of the patients with mTET treated at our institute and to evaluate the influence of potential prognostic factors and different therapeutic strategies on the treatment outcomes. All consecutive cases diagnosed with mTET and received at least three cycles of first-line palliative CT, between January 2010 and September 2017, at the Department of Medical Oncology, Kidwai Memorial Institute of Oncology, Bengaluru, Karnataka, India, were investigated retrospectively. All the patients underwent a detailed baseline evaluation including full medical history, physical examination, complete blood count, serum biochemical analysis, viral markers, electrocardiography, two-dimensional echocardiography, bone scan, contrast-enhanced computed tomography (CECT) of the thorax, abdomen, and pelvis, and CT-guided biopsy of the mediastinal mass. The diagnosis of TET was confirmed by microscopic examination and immunohistochemistry of the biopsy specimens. The immunohistochemical profile was performed using a panel of cytokeratin 19, cytokeratin 20, P63, P40, terminal deoxynucleotidyl transferase, CD5, and/or CD117 (c-KIT). Histology was classified according to the 2015 WHO classification of thymic tumors. Patients were staged according to the Masaoka–Koga staging system. Patients were offered any one of the following first-line palliative CT regimens—ADOC, paclitaxel + carboplatin, or Cyclophosphamide Adriamycin Cisplatin (CAP). All the regimens were given every 3 weeks. The ADOC regimen consisted of doxorubicin 40 mg/m2 plus cisplatin 50 mg/m2 on day 1, followed by vincristine 0.6 mg/m2 on day 3 and cyclophosphamide 700 mg/m2 on day 4. The paclitaxel + carboplatin regimen consisted of paclitaxel 175 mg/m2 and carboplatin AUC 5 on day 1, and the CAP regimen consisted of cyclophosphamide 500 mg/m2, doxorubicin 50 mg/m2, and cisplatin 50 mg/m2 on day 1. All the patients also received appropriate hydration, premedication, and prophylactic granulocyte colony-stimulating factor. Treatment was continued until disease progression, unacceptable toxicity, death, or consent withdrawal. After first-line CT had failed, second-line CT was recommended to all the patients if their performance status was preserved. CECT scans were repeated after three and six cycles of first-line palliative CT. In case of clinical suspicion of disease progression, urgent CECT scans were requested whenever needed. After the active treatment phase of the study, subsequent CT scans have been performed every 12 weeks (±2 weeks) or whenever needed depending on the symptoms. Response to CT was reported according to the Response Evaluation Criteria in Solid Tumors, version 1.1. 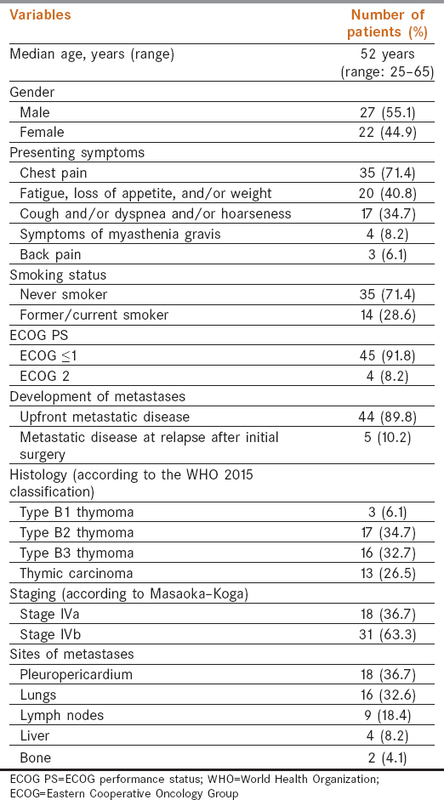 The adverse events were classified based on the National Cancer Institute of Canada Common Terminology Criteria for Adverse Events version 4.0. Duration of progression-free survival (PFS) was defined by the time from the treatment initiation until the documented disease progression, and overall survival (OS) was calculated from the date of diagnosis until death. Median PFS and OS were taken as the primary end points for this retrospective analysis, and the secondary end points were response rates and toxicity profile. The strength of the association between OS and different prognostic variables was investigated by Kaplan–Meier OS curve and log-rank test. These variables included age (≥50 vs. <50 years), gender (male vs. female), histology (thymoma vs. thymic carcinoma), disease Stage (IVa vs. IVb), and response to first-line palliative CT (responder vs. nonresponder). A “responder” was defined as a patient with complete or partial response after first-line CT, and patients with stable disease or progressive disease were labeled as “nonresponders.” All statistical analyses were performed using SPSS version 17.0 for Windows (SPSS Inc., Chicago, IL). A total of 49 cases of mTET were retrospectively reviewed. Median age at diagnosis was 52 years, and majority were males (n = 27, 55.1%). Eastern Cooperative Oncology Group performance status was determined as ≤1 in majority (91.8%) of the patients. Thirteen (26.5%) patients had thymic carcinoma and the rest of the 36 patients had thymoma of various histological types. At presentation, 19 patients (38.8%) had elevated serum lactic acid dehydrogenase level and 4 patients (8.2%) had myasthenia gravis. Other baseline demographic and clinical characteristics are depicted in [Table 1]. Patients were treated with either first-line ADOC regimen (n = 41), paclitaxel + carboplatin regimen (n = 5), or CAP regimen (n = 3). The median number of first-line palliative CT cycles received was six (range: 3–8). Two patients (4.8%) in the ADOC arm (n = 41) required 20% dose reduction in the subsequent cycles due to grade 4 febrile neutropenia after first cycle of CT. Twenty patients (48.8%) in the ADOC arm (n = 41) received second-line CT with paclitaxel + carboplatin, after failure of first-line regimen. The response rates with various first-line palliative CT regimens are documented in [Table 2]. Overall, 41 patients (83.7%) had disease control, and among them, 19 patients (38.8%) had partial response and 22 patients (44.9%) achieved stable disease. None of our patients had a complete response while eight patients (16.3%) had progression of disease after first-line treatment. The median PFS and OS were 11.2 months (95% confidence interval [CI], 8.7–13.6) and 20.2 months (95% CI, 17.1–22.8), respectively, for the whole cohort (n = 49). A significant difference in the median survival according to the metastatic sites was observed. 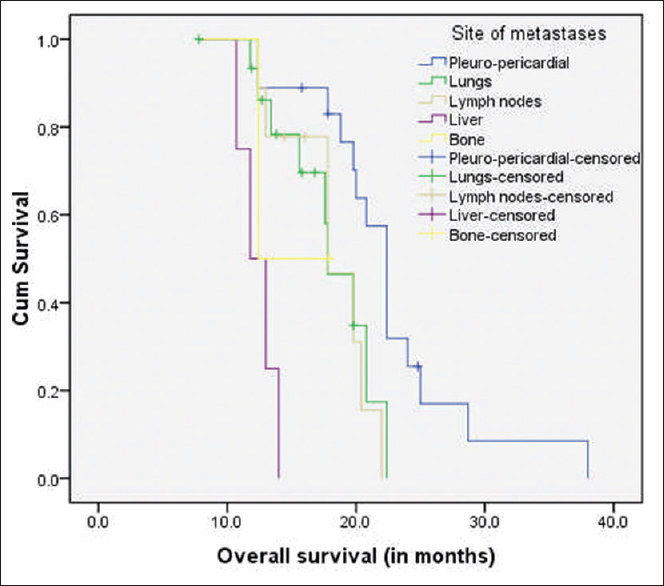 The median survival of the patients with pleuropericardial dissemination (Stage IVa) was 22.4 months (95% CI, 20.7–24.8), and that of the patients with lungs, lymph nodes, liver, and bone metastases (Stage IVb) were 17.8, 17.8, 11.8, and 12.4 months, respectively [Figure 1]. The difference of median OS between Stages IVa and IVb disease was statistically significant (log-rank P = 0.000). 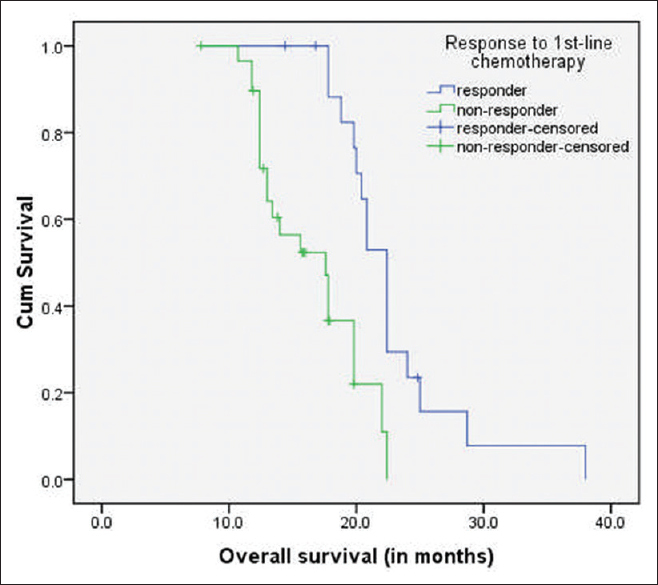 In a separate subgroup analysis, we also found that patients who had a response after first-line CT had a better median OS (22.6 months; 95% CI, 21.2–24.4) than that of the patients who did not have any response (17.4 months; 95% CI, 13.8–20.3) [Figure 2]. And again, this difference of median OS between the “responders” (n = 19) and “nonresponders” (n = 30) was statistically significant (log-rank P = 0.000). Other potential prognostic factors such as age, gender, and histology did not have any significant impact on survival outcomes. First-line palliative CT was well tolerated in our patients, and most of the toxicities were grade 1 or 2, including neutropenia, thrombocytopenia, nausea, vomiting, anorexia, fatigue, and renal dysfunction. In the ADOC arm (n = 41), four patients (9.7%) developed grade 3 or 4 neutropenia and two (4.8%) of them had grade 4 febrile neutropenia. A 20% dose reduction was done in the subsequent cycles for these two patients. The overall toxicity profile of first-line palliative CT is depicted in [Table 3]. To the best of our knowledge, till date, there is only one published report of treatment outcomes in TETs in Indian patients. In 2014, Rathod et al. reported a retrospective series of 62 cases of TETs, treated at Tata Memorial Hospital, Mumbai. In that series, the median age at presentation was 51.5 years; majority of the patients were male (58%); and 14% patients had Stage IV disease at baseline. The 3-year OS of the patients with unresectable disease and Stage IV disease were 81 and 69%, respectively. The palliative CT regimens used were CODE, CAP, and Cisplatin Etoposide (PE). In the current retrospective analysis, we reported the treatment outcomes of advanced/mTET cases (n = 49) treated at our center with various platinum-based first-line palliative CT regimens. The response rates, survival outcomes, and toxicity profile of first-line CT, in our series, were comparable to those of other published reports. Moreover, the results of the present study suggested that patients who responded to first-line CT and those with pleuropericardial dissemination (Stage IVa disease) might have a better median OS than nonresponders and those with Stage IVb disease, respectively. Clearly, these findings need validation through larger prospective studies from other Indian centers. In the current study, we retrospectively investigated the clinicopathological characteristics of mTET cases together with an analysis of survival outcomes and toxicity profiles of different first-line palliative CT regimens. First-line therapy with various doublet or triplet combinations was well tolerated in our patient population and achieved a disease control rate of 83.7%. The results of the present study indicated that patients who responded to first-line CT and those with Stage IVa disease might have a better survival outcome than nonresponders and those with Stage IVb disease, respectively. Clearly, larger prospective studies from other Indian centers are required to elucidate potential prognostic factors and for getting a better picture of mTET in our country. Strollo DC, Rosado de Christenson ML, Jett JR. Primary mediastinal tumors. Part 1: Tumors of the anterior mediastinum. Chest 1997;112:511-22. Detterbeck FC, Parsons AM. Management of stage I and II thymoma. Thorac Surg Clin 2011;21:59-67, vi-vii. Engels EA, Pfeiffer RM. Malignant thymoma in the United States: Demographic patterns in incidence and associations with subsequent malignancies. Int J Cancer 2003;105:546-51. Ruffini E, Detterbeck F, Van Raemdonck D, Rocco G, Thomas P, Weder W, et al. Thymic carcinoma: A cohort study of patients from the European Society of Thoracic Surgeons Database. J Thorac Oncol 2014;9:541-8. Marx A, Chan JK, Coindre JM, Detterbeck F, Girard N, Harris NL, et al. The 2015 World Health Organization classification of tumors of the thymus: Continuity and changes. J Thorac Oncol 2015;10:1383-95. Detterbeck FC, Nicholson AG, Kondo K, Van Schil P, Moran C. The Masaoka-Koga stage classification for thymic malignancies: Clarification and definition of terms. J Thorac Oncol 2011;6:S1710-6. Fornasiero A, Daniele O, Ghiotto C, Piazza M, Fiore-Donati L, Calabró F, et al. Chemotherapy for invasive thymoma. A 13-year experience. Cancer 1991;68:30-3. Loehrer PJ Sr., Kim K, Aisner SC, Livingston R, Einhorn LH, Johnson D, et al. Cisplatin plus doxorubicin plus cyclophosphamide in metastatic or recurrent thymoma: Final results of an intergroup trial. The Eastern Cooperative Oncology Group, Southwest Oncology Group, and Southeastern Cancer Study Group. J Clin Oncol 1994;12:1164-8. Carlson RW, Dorfman RF, Sikic BI. Successful treatment of metastatic thymic carcinoma with cisplatin, vinblastine, bleomycin, and etoposide chemotherapy. Cancer 1990;66:2092-4. Schmitt J, Loehrer PJ Sr. The role of chemotherapy in advanced thymoma. J Thorac Oncol 2010;5:S357-60. Yoh K, Goto K, Ishii G, Niho S, Ohmatsu H, Kubota K, et al. Weekly chemotherapy with cisplatin, vincristine, doxorubicin, and etoposide is an effective treatment for advanced thymic carcinoma. Cancer 2003;98:926-31. Magois E, Guigay J, Blancard PS, Margery J, Milleron B, Lher P, et al. Multimodal treatment of thymic carcinoma: Report of nine cases. Lung Cancer 2008;59:126-32. Lemma GL, Lee JW, Aisner SC, Langer CJ, Tester WJ, Johnson DH, et al. Phase II study of carboplatin and paclitaxel in advanced thymoma and thymic carcinoma. J Clin Oncol 2011;29:2060-5. Agatsuma T, Koizumi T, Kanda S, Ito M, Urushihata K, Yamamoto H, et al. Combination chemotherapy with doxorubicin, vincristine, cyclophosphamide, and platinum compounds for advanced thymic carcinoma. J Thorac Oncol 2011;6:2130-4. Igawa S, Murakami H, Takahashi T, Nakamura Y, Tsuya A, Naito T, et al. Efficacy of chemotherapy with carboplatin and paclitaxel for unresectable thymic carcinoma. Lung Cancer 2010;67:194-7. Okuma Y, Hosomi Y, Takagi Y, Iguchi M, Okamura T, Shibuya M, et al. Cisplatin and irinotecan combination chemotherapy for advanced thymic carcinoma: Evaluation of efficacy and toxicity. Lung Cancer 2011;74:492-6. Rathod S, Munshi A, Paul S, Ganesh B, Prabhash K, Agarwal JP, et al. Thymoma:First large Indian experience. Indian J Cancer 2014;51:109-12.